Tuberculosis (TB) is caused by the bacterium Mycobacteria tuberculosis. It most commonly presents in the lungs because inhalation of the M. tuberculosis organism is its easiest mode of entry into the body. It can be really difficult for a clinician to suspect if a patient has TB. This is because visible symptoms do not show immediately. It may even take years. M. tuberculosis can be tested for in sputum samples by sending them to a microbiology lab, where they culture it (see left)- but this can take several weeks. A new – much faster – DNA test can also detect M. tuberculosis, but this is not widely available. Once settled in the lungs, M. tuberculosis causes a huge inflammatory response. These bacteria, however, are tough; their cell wall contains mycolic acids, which act like a force field, making them resistant to destruction in both the environment and inside our bodies. The acute inflammatory response soon becomes a chronic one, with more inflammatory cells homing in on the organisms to try to get rid of them. The efforts of this second wave of inflammatory response also prove futile as the bacteria often continue to thrive. In some cases, however, when the infection is not too extensive or virulent, our inflammatory cells have a back up plan. Plan C results in our immune cells ceasing their efforts in trying to engulf the organisms and, instead, starting to tightly surround the bacteria, so to wall off the infection and prevent any further spread. This barricade begins to form a new structure, known as a granuloma (see below). The immune cells that specifically gobble up things like bacteria, dead cells and other general bits and pieces that aren’t welcome in the body, are called macrophages. Over time, when granulomas are formed, these macrophages fuse together to become one giant cell with multiple nuclei. The giant cell becomes one big hungry pacman, with M. tuberculosis as its dots of food. Granuloma (H&E stain) The red outline highlights the distinct structure of the barricade, caused by immune cells bunching together to surround the offending culprit in the centre, like one big ring-a-ring-o’-roses. 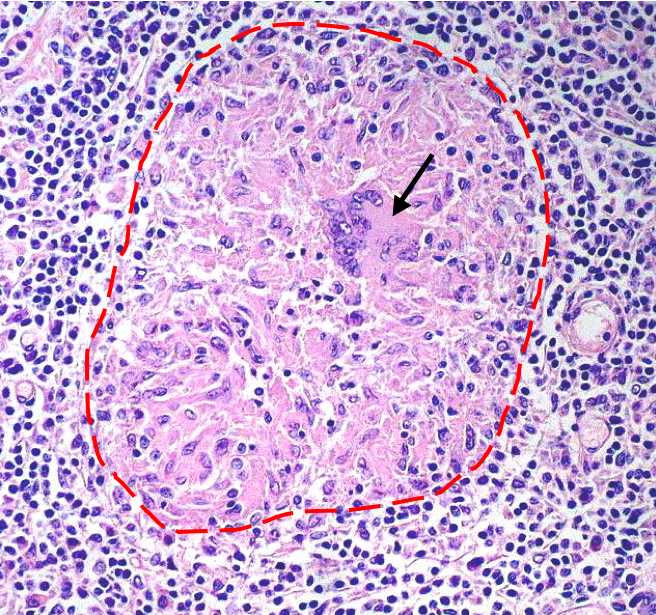 The arrow shows a multinucleated giant cell; formed of multiple macrophages that have fused together. Granulomas, however, are not exclusive (or independently diagnostic) of M. tuberculosis infection, as they can also form around foreign bodies (such as splinters or even breast implants) and can be found in a number of other pathologies such as Crohn’s disease and sarcoidosis. A granuloma caused by M. tuberculosis is actually called a tubercle. The outcome of the tubercle formation is dependent on how good the host’s immune system is at containing the infection and also the appropriate administration of antibiotics. If a patient has had surgery to remove a suspect-looking area, it’s then sent on to a histology lab. All histology samples are processed and stained with an H&E stain (example above). If the histopathologist spots a granuloma on the initial H&E, they may want to test the sample for M. tuberculosis, just in case. 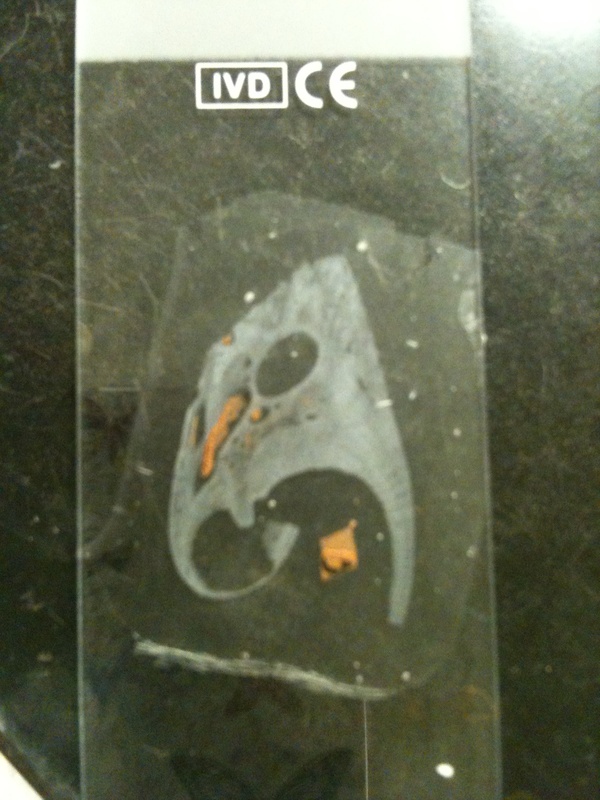 Another section of the same tissue is cut and mounted on a slide. Opposite you can see an unstained section of tissue. The tissue has been embedded in a block of wax, so the rectangular frame you can see around the section is just the wax it is supported in. The slide is then put into the oven to melt the wax, thus securing the section to the slide. Once the wax is melted sufficiently, the slide is then put through a series of reagents (xylene and alcohol) to remove the wax, so that the section can be stained more easily. To look for M. tuberculosis, the tissue section is stained with a pink stain called carbol fuchsin. This is the first stage of the M. tuberculosis staining protocol known as the Ziehl-Neelsen, or ZN, stain. Carbol fuchsin is a great stain for TB because it has a high affinity for the mycolic acids found within the cell wall of the bacteria. As nothing is ever simple, just the staining of the section with carbol fuchsin is not enough because, as well as the M. tuberculosis, this actually stains everything else, too. If we were to put the slide under the microscope at this stage, everything would be bright pink. It’s not distinctive enough and so we have to selectively remove the pink from everything else in the section, other than the TB bugs. Here comes the clever bit. Fortunately for histologists, M. tuberculosis is an “acid-fast bacillus”, which basically means it cannot be decolourised by acid. So, the next step in the ZN stain is to flood the section with an acid-containing alcohol. This solution then washes all the pink out of all the other parts of the tissue that aren’t M. tuberculosis – this step is called “differentiation”. As you’ve probably guessed, this now means we’re pretty much back to square one with an unstained section, bar the pink-staining TB bugs. Looking at unstained sections under the microscope is not useful at all because they lack structural definition and the orientation of the area of interest is difficult to determine. So, to get around this, a “counter-stain” is used. Many staining protocols need counterstains to colourise the background and there are many available to use. They are normally chosen by their colour; the colour that will have the greatest contrast with the diagnosis of interest. As the TB bugs stain a bright pink, the most commonly used counterstain in the ZN protocol is a blue stain called methylene blue. 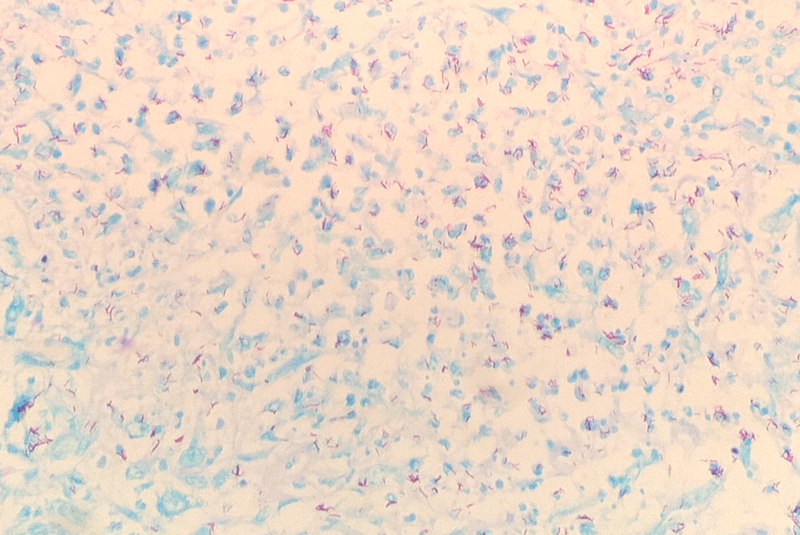 ZN stain: showing TB bugs as bright pink rods against a pale blue background. This photomicrograph shows a fairly moderate infection, with numerous bugs, but only one pink rod is enough to diagnose TB. These rods are only 2-4 micrometers (µm) in length and only 0.2-0.5 µm in width (one µm is equal to 0.001mm), so you really do need a good eye for spotting these buggers!! Where was the tissue from, a lung biopsy? My Grandmother lost a kidney at the age of 12 to TB after drinking milk straight from a cow. Very difficult to diagnoses in those days, particular when the routine sputum culture showed no clues. Please forgive me, I somehow overlooked your comment from back in March. Thanks for sharing your grandmother’s case of TB. So sorry to hear she lost a kidney so young, I can only imagine what diagnosing used to be like back then. Yes, the tissue in the ZN stain photomicrograph is lung. It is a wedge of lung, rather than a small biopsy.